Bold Letters is promoted as a browser extension that can improve your web search experience. However, this browser extension is an adware program that can also leak your personally non-identifiable information to associated third parties for commercial purposes. Therefore, computer security experts suggest that you remove Bold Letters from your browser and your computer immediately. Bold Letters does not present you with any removal difficulties, but you should still scan your computer with the SpyHunter free scanner just to be on the safe side. For all it’s worth, there might be multiple adware programs running on your system. You must have noticed already that Bold Letters is more annoying than dangerous. This adware program belongs to the SuperWeb family of similar applications. The number of programs that belong to this group of adware is steadily growing. All of the applications are practically identical, and that is why the number is growing so fast: It is rather easy to release adware clones one after another. Consequently, Bold Letters is the same as Global Gadget, Write Results, Intense Results, Screen Flip, and so on. Thus, everything we known about these programs can be applied to Bold Letters as well. The most important thing about the SuperWeb application is that they have the distinctive homepage design with the green download button that does not work. Thus, opening boldletters.net is of no use. The website only provides you with generic information on Bold Letters, but it does not say anything specific. How does Bold Letters manage to enter your system? Adware programs seldom employ direct distribution. 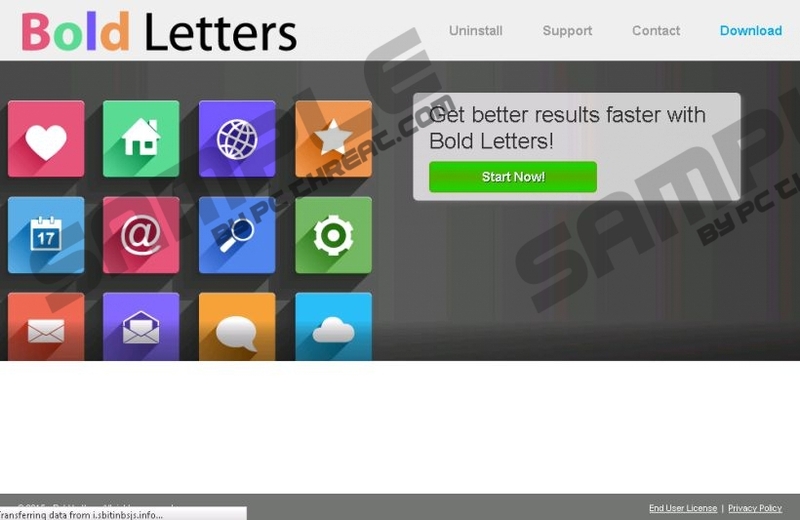 The most widespread way for Bold Letters and similar apps to get installed on a target computer is to come bundled with freeware. Freeware bundles can be encountered anywhere. They can be downloaded from a file-sharing website. They might be embedded in annoying pop-ups that offer users to download and install a media player update. They could also be hiding behind fake download buttons in torrent websites. The bottom line is that you have to be attentive whenever you visit unfamiliar websites. Bold Letters aside, you might end up installing a malicious program on your PC too. And a genuine computer infection is far more difficult to remove than Bold Letters. To uninstall Bold Letters, open your Control Panel and simply delete the program. Extensions from your browser should disappear automatically. If you do not know which other programs you are supposed to remove as well, invest in a licensed antispyware scanner. This way you will no longer have any doubts about your computer’s security status. Open Uninstall a program and remove Bold Letters. Select Uninstall a program and remove Bold Letters. Go to Add or remove programs and uninstall Bold Letters. Quick & tested solution for Bold Letters removal.